Yesterday, I went to the Barrio Fiesta at Stormont Pavillion in Belfast. 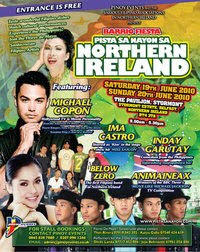 Its a festival which celebrates filipino culture and food. It was a fantastic day, lots of different performers, many types of foods, though I reliably informed the 'halo-halo' wasn't sweet enough. I now resemble a cooked lobster, having exposed my pale white skin to a good few hours of the Belfast sun I am almost semi-cooked. It was an unusally hot day for Belfast, even my aparently filipino blood dude Jade was a bit lobster like after a day in the sun.